I don’t think there is anything this side of Saturn that tastes better than a warm cookie fresh from the oven. These White Chocolate Coconut Cookies are fabulous! If Cookie Monster were to taste them he just may give up his Chocolate Chip regulars, folks. Maybe the sophistication of White Chocolate would help his vocabulary increase! do strange things to a person. on the mind a good deal of the time. 1. In a Kitchen Aid mixer or in a large mixing bowl cream together the butter and sugar. Let it mix for about 3 minutes. 2. Add your egg, milk and vanilla and mix for 2 more minutes. 3. In a separate small mixing bowl combine the flour, baking soda, baking powder and salt. 4. Add the dry ingredients to the creamed butter and sugar and mix for 1 minute. 5. Pour in your white chocolate chips and coconut. Mix just until combined. 6. Roll into 1 1/2 inch balls and place on a sprayed cookie sheet. Press the balls down just a bit and bake at 350 for 10 minutes. The real key to making heavenly cookies, is baking them well. You don't want to over bake, folks. Crispy cookies are not nearly as wonderful as chewy ones! Watch the cookies. When they start to crack, and are just slightly golden around the edges take them out of the oven. I have a convection oven and so I cooke them at 325 for 7 minutes. Let them continue to cook on the hot cookie sheet for 3-4 minutes. Enjoy! Oh, I love how you made these white chocolate!! They look perfect! Absolute beauties, this is going into my bookmarks! Thanks for sharing this recipe. All these yummy recipes you are posting are making it hard to be good. I think I was cookie monster in a previous life too. I obsess about cookies, homemade cookies that is. Nothing is more fun than making cookies! Noone in my family likes coconut. Would it ruin the cookies if I left out the coconut? You could indeed leave out the coconut. Let me know how they turn out! AMAZING COOKIES!!! And may I just say 1 or 2 minutes make a BIG difference. I can taste the coconut and the white chocolate in the first batch and the second batch I cooked it longer by a minute and they were just okay…not at all like the first. Definitely watch your timing! My mother-in-law can't to try them!!! Thank you for another AMAZING recipe. I'm so glad you have tried them! And yes, the cooking time makes a huge difference. Way to go! Thanks for letting me know how well they turned out. I have been food blog hopping for days now and I must say, your blog is beautiful!! I put it in my favorites! 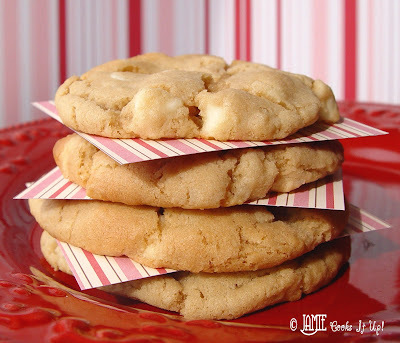 I can't wait to try those white chocolate coconut cookies!! YUM! I finally had a chance to make these and oh they lived up to everything I had imagined. I did add the zest of one lime to the batter. Extra Yummy! Thanks for sharing your talent and cooking expertise. I made these tonight. My oldest daughter loves white chocolate and I needed to use up some coconut in the fridge. They are so moist, rich, and delicious. This is definitely a keeper for my recipe file! Thanks! I need to use up some coconut and white chocolate chips and went searching for a recipe and found this site. Made them yesterday and there is not one left. Perfect! Can't wait to try the Lemon Cookies with white chocolate. Thanks. The recipe is a keeper. I made these and they turned out AMAZING! So easy, and so delicious! Perfect texture and perfect balance of sweetness. Thanks! Oh my gosh, I'm making these tomorrow. I could kick myself for not buying white choc chips at the last Smith's sale, I bought all choc. I love love love reading your blog more than anything though, you are so funny you make my day! I wish you were my next door neighbor, or my sister, or aunt, or… what ever – we need someone like you in our family to help us with our boring meals!! Your blog is the best!! I made these yesterday and all I can say is yumm! This recipe is a keeper. Would you use fresh coconut for this or packaged? Packaged coconut would work best. Good luck! Does this dough do well when doubled? I have no butter on hand and may have to use margarine…I DO hope it turns out as delicious as these look! Mine didn’t crack. Does anyone have any idea why? ummmm can’t wait to make these. they have all my favorite ingredients.